beauty of the XV century art is without parallel... especially the Northern European painting, sculpture and the Gothic architecture. 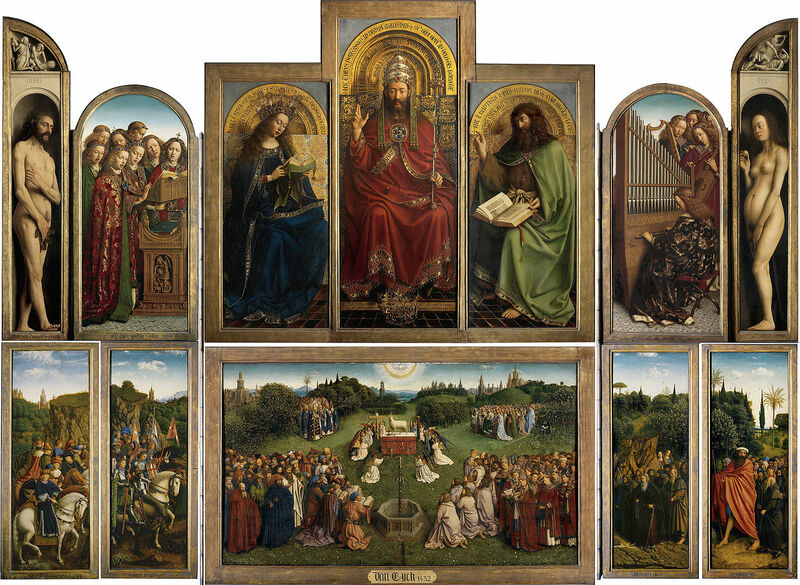 Gent Altarpiece - is one such example. 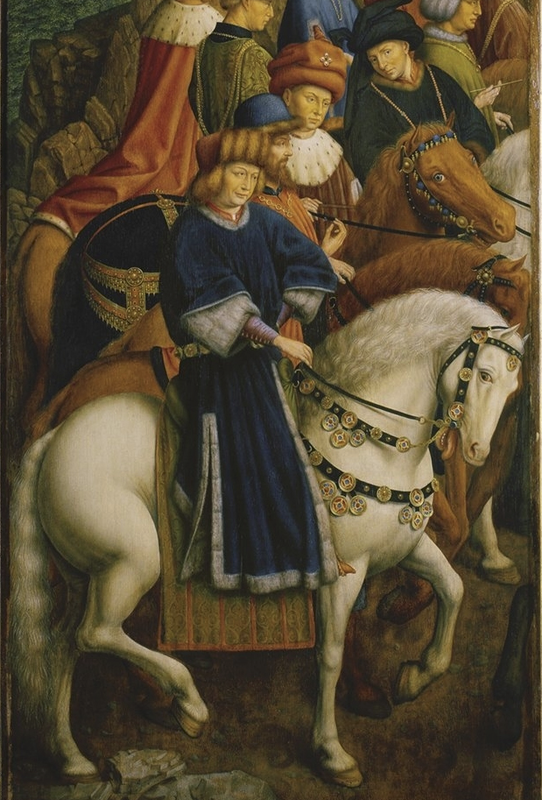 Painted for the Saint John Church (now Saint Bavo Cathedral) in Ghent by brothers Hubert and Jan van Eyck at the order of the Ghent magistrates. These are saints and historic figures - the saints are holy patrons of the Gent militia, within the realm of Duchy of Burgundy. On a dappled grey sits Saint Martin (or Victor) with a shield with the arms of Utreht, cross argent. 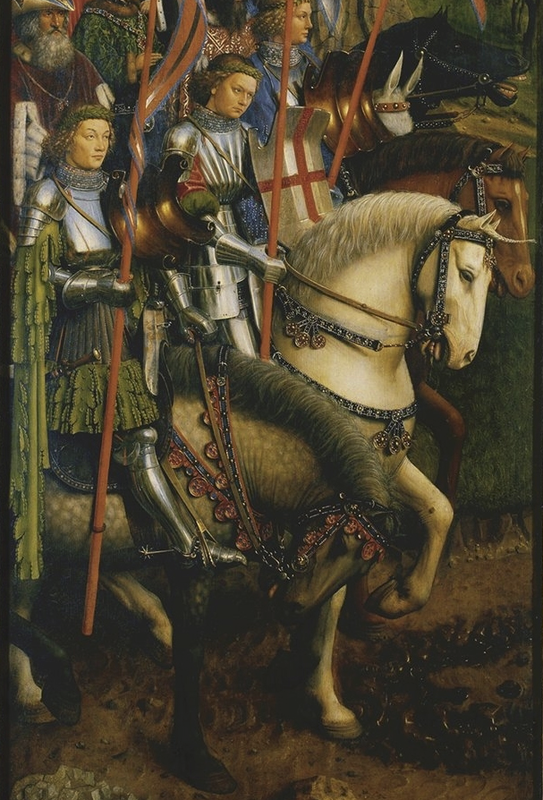 St. George is on a white charger with a shield bearing Red Cross on a field of gold and carrying a lance with such banner, he is in full modern armor circa 1430, and his armored saddle (pommel visible) is one of the earliest depictions of the armored saddles (see The Armored Horse in Europe, 1480-1620, p, 19-20). Beyond him on a black horse the ideal king - Charlemagne , and on a grey mule Godfrey de Bouillon, and some other princes and knights. 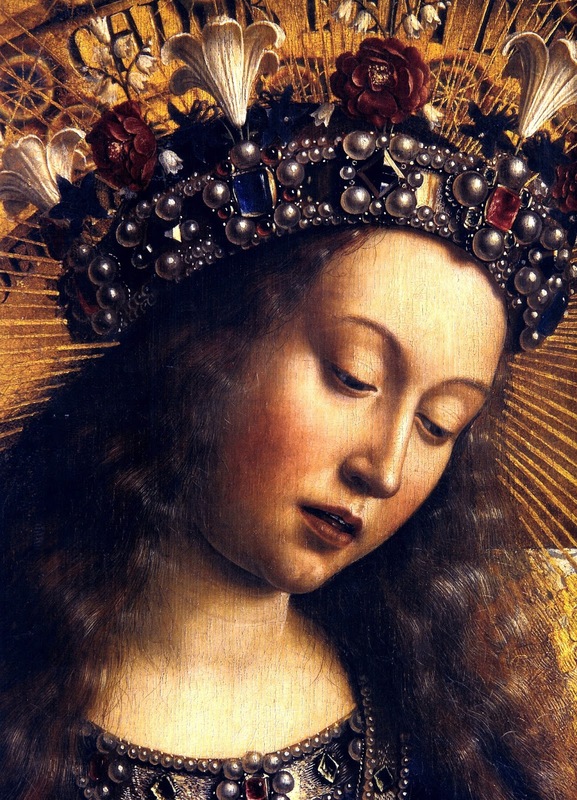 the pearls of Virgin Mary's crown are wonderfully painted and could be a study for any painter how to paint jewlery - all images are from Wikimedia Commons and are part of this article . Afterwards I saw the Jan [Van Eyck's] picture, which is a very splendid, deeply studied painting, and especially the "Eve," the "Mary," and "God the Father" were extremely good. And my personal shame- one of the biggest in my whole life- 4 years ago I spent 5 days in Ghent and... wasn't in the saint John church. I am extremely stupid- need admit. 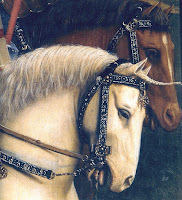 By the way what about Bruges and tradition of horses there? I have never been to Ghent - and live not too far from there a couple summers ago.. prose of life. 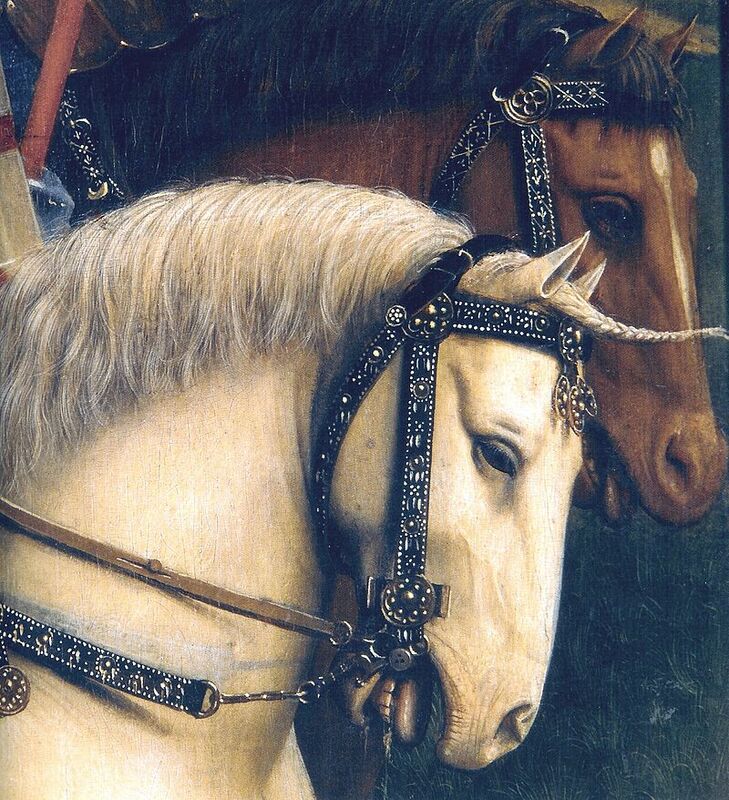 I am not sure about the Bruges horses - what do you mean, could you explain, please?